My parents have lived in Albuquerque for ten+ years now, so I am out there fairly regularly. As an added bonus, I have two friends from college who also live in Abq so my visits often have dual purpose. One of them got married over Labor Day weekend, so I took the opportunity to stay for a week as opposed to my normal 3-4 days at Christmastime. 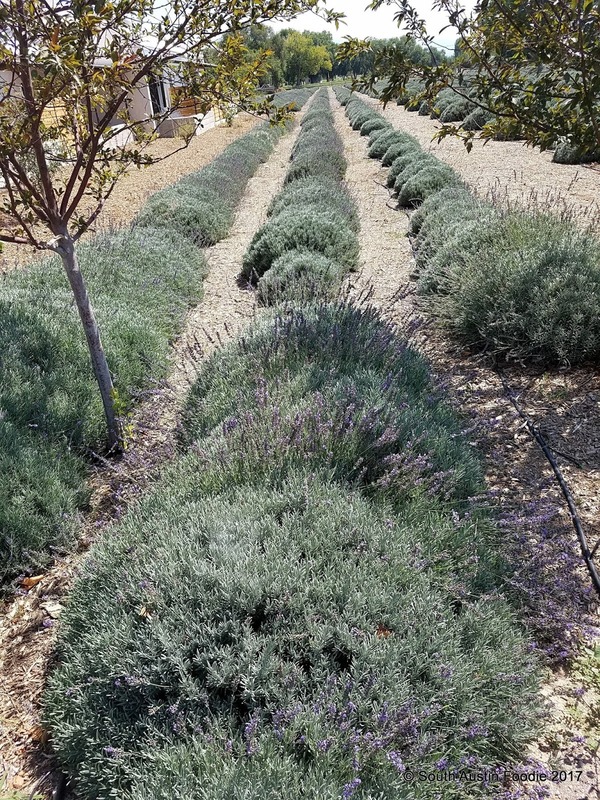 Lavender at Los Poblanos Historic Inn + Organic Farm in the North Valley. Fortunately, I come from a family that appreciates good food -- it must be in the genes! My parents consider Abq's food scene about where Austin was 10 years ago. 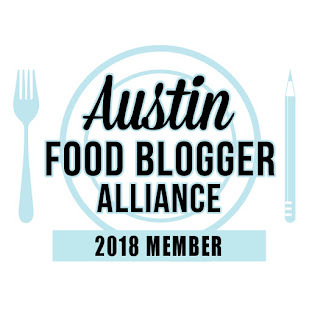 There are a bunch of up and coming places, but not as much that is truly WOW like Uchi, which is someplace my parents always insist upon eating when in Austin. But there are still a number of good standbys in Abq, many with distinctive New Mexican touches to them, as well as places that are on the rise. Burque Bakehouse's cruffin, a croissant/muffin combo which was heavenly. They also did three different pies for the wedding. I had lunch at the Flying Star, which has six locations around town, open 7 am - 9 pm. 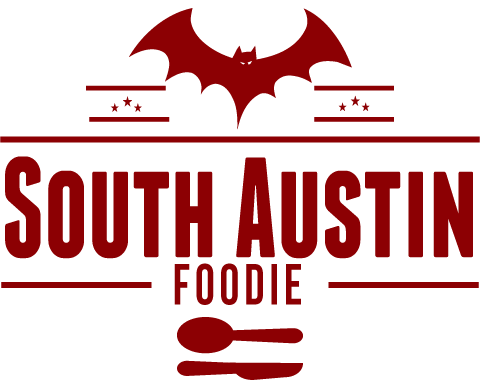 Breakfast all day, salads, sandwiches, and large desserts, there's something for everyone here, kind of like a Kerbey Lane here in Austin. I was too busy catching up with friends that I neglected to take a picture of my Chinese Crunch salad that would practically feed two people. 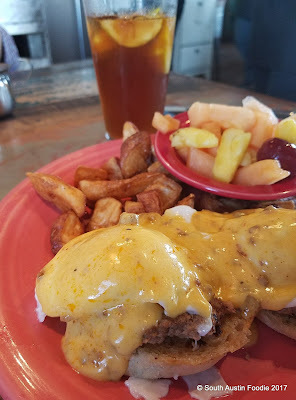 Our group of six college friends had Sunday brunch at the Frontier, across from the University of New Mexico campus. Built like a barn, you order at the counter, find a seat (there are five dining rooms -- the place just keeps going back and back), and watch the digital screens to see what order number is up. And open almost all day, from 5 am - 1 am, I am sure many a collegiate hangover has been nursed by this greasy spoon's offerings. Though I have to say, it was much less greasy than I was anticipating. 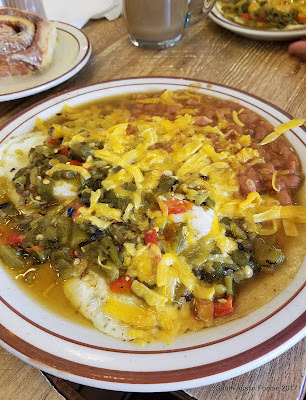 A couple of my friends had the huevos rancheros with green chile, and there were a few giant cinnamon rolls on the table too. I had the breakfast burrito with hash browns, egg, sausage, and the requisite green chile; delicious and not greasy! But also not as photogenic, so here's the huevos rancheros. 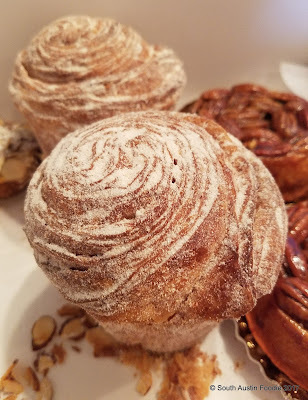 I didn't love the cinnamon roll, though others did; I thought it was too doughy and the frosting glaze was made with margarine, not butter. Huevos rancheros and the cinnamon roll in the top left. Another Abq classic is the Range, with four locations around town, including the newest, which is in Old Town, where we had lunch. 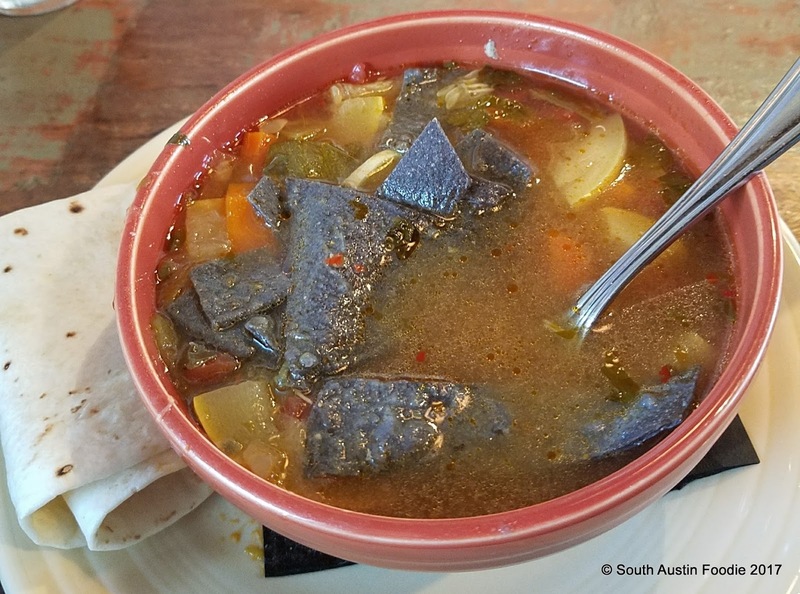 I had the green chile chicken stew with blue corn tortilla strips, which was a nice lighter meal. And here's the New Mexico Benny with green chile turkey sausage and chorizo gravy. There's poached eggs in there somewhere! Wedding guests were staying at the Hotel Albuquerque in Old Town. 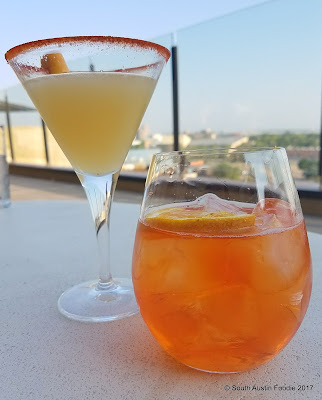 It's new sister property is the upscale Hotel Chaco, and we ventured to their rooftop bar, Level 5 for cocktails and panoramic views. 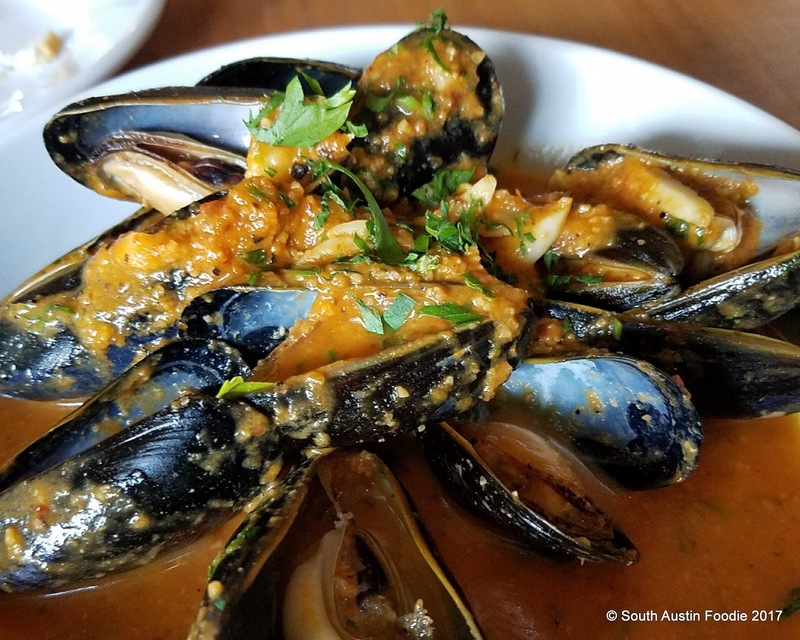 Nob Hill could be compared to Austin's SoCo, with it's hip vibe, plethora of eating places and artsy feel. Former James Beard semifinalist Jennifer James opened her new spot Frenchish about a year ago along Central Ave. My parents have been regulars at her previous spots (now closed), and as the name implies this new one has a French influence to the food but doesn't take itself so seriously. 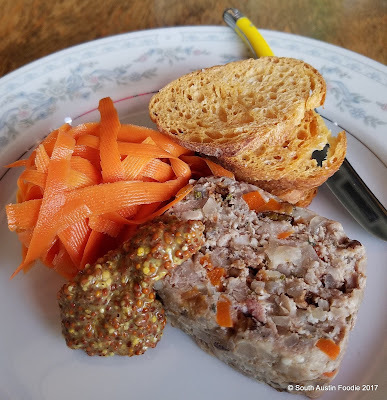 We shared the rabbit terrine, where the lightly pickled carrots gave a nice balance to the strong mustard. 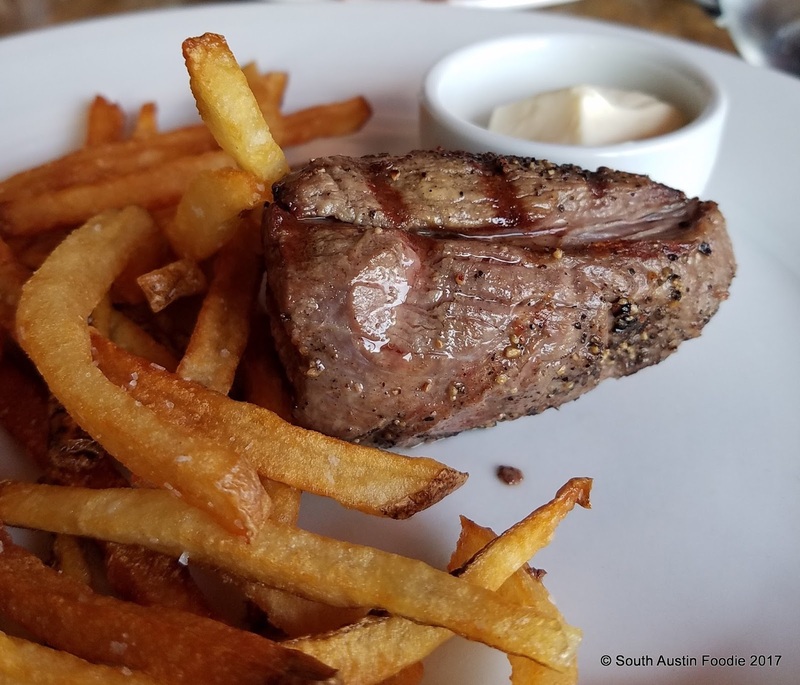 I had the 3-course prix fixe, with a tossed salad, 4 oz petit filet with pomme frites, and a chocolate pot de creme. The salad was dressed perfectly and the steak a nicely done medium rare. 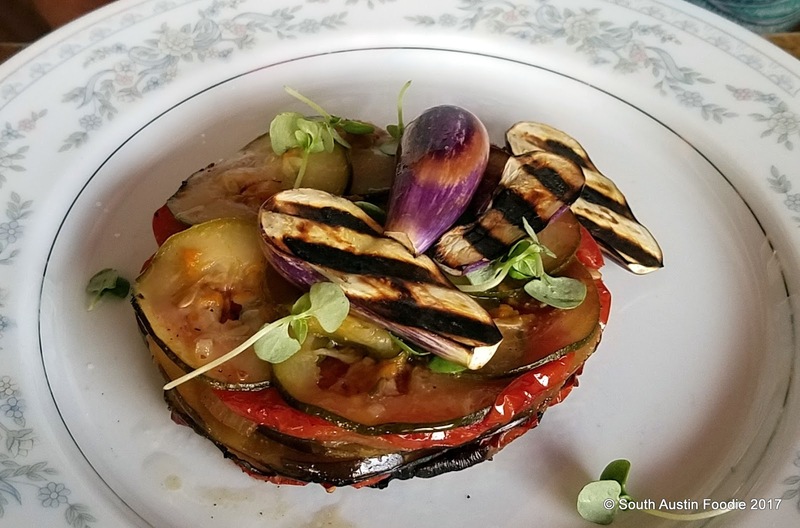 Mom's ratatouille, and Dad had a burger, which you can probably guess what it looked like. 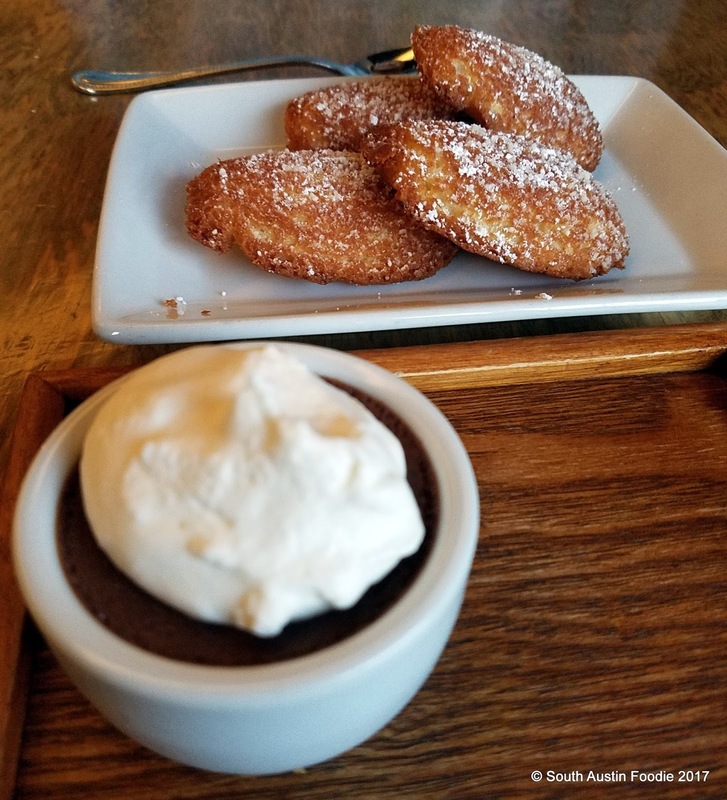 Now the pot de creme was good, but the made to order madelines were incredible. Warm, with crispy edges and a soft crumbly interior, it was an ideal way to end the meal. Bonus coverage! 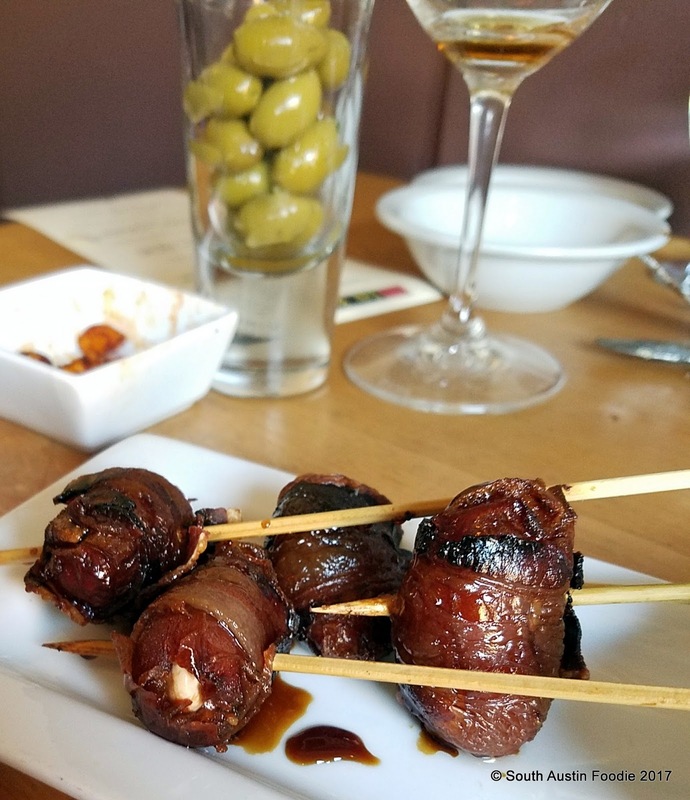 We went to Santa Fe one afternoon, and had an early dinner at La Boca, a Spanish tapas place just blocks from the main plaza. 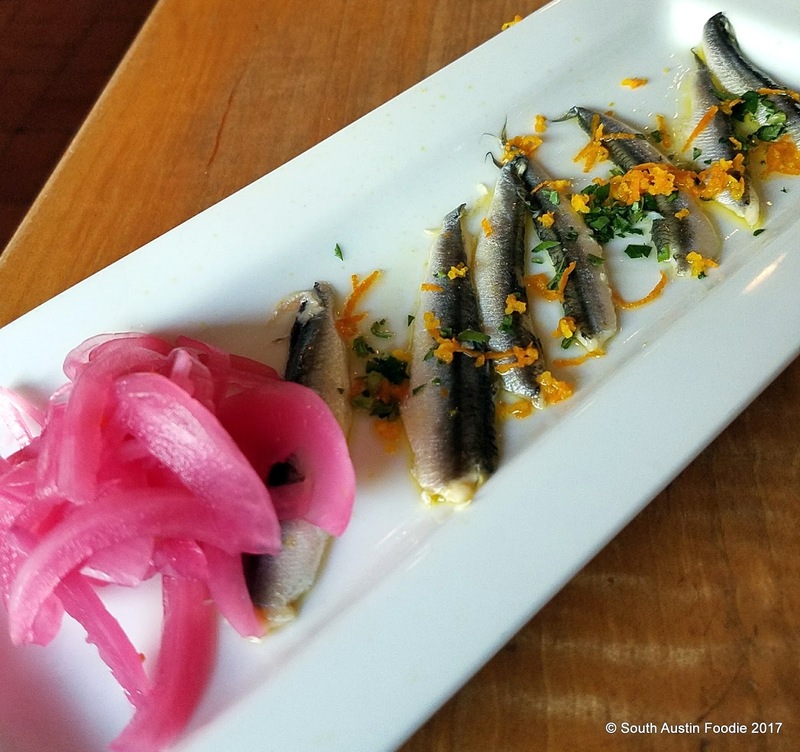 These little boquerones (white anchovies) with olive oil and citrus were quite fresh. Loved the Spanish flavors of the mussels in a Romesco broth. And the bacon-wrapped dates, stuffed with a marcona almond and a cabrales blue cheese sauce on the side were delicious. And finally, sunset over the Jemez Mountains, between Santa Fe and Albuquerque, as taken from the passenger window of the car on Interstate 25. 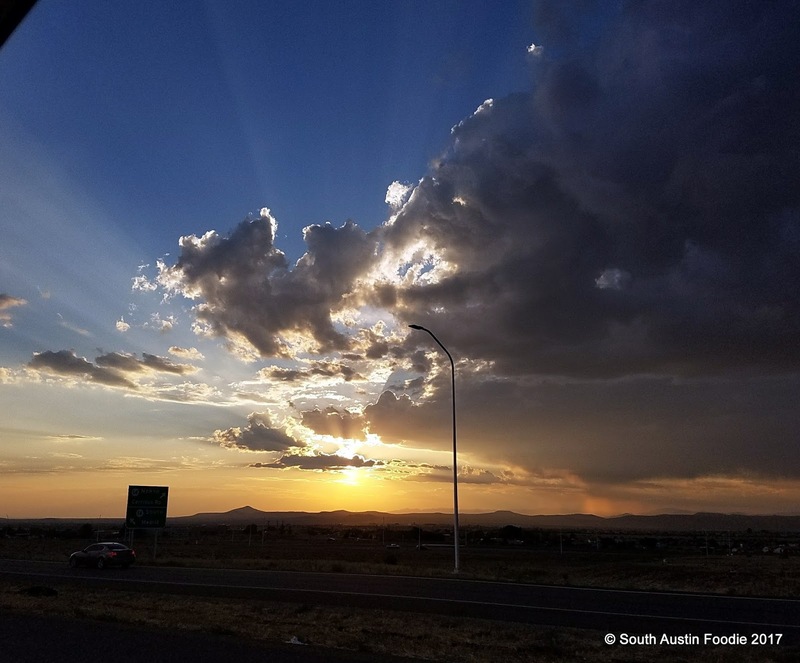 Yes, it's the Land of Enchantment.